Just as the title states, we're running The Eagle's Nest Cooperative Campaign using @PatrickAWlson's PWCG, on Wednesdays at 8pm Eastern (7pm Texas time). Our campaign system is running on a dedicated server using dserver that is located in the East coast with great ping. This is good for you pilots, because unlike a coop campaign running on a client's box, with our dserver, we can add more ai enemy planes than you'd normally see without any performance hits. We've had six to eight pilots consistently, and have run into 16-20 ai planes all in formation either attacking us or ground targets. We strive for historical realism, with a good balance of fun mixed in. Much like real life, the campaign's missions do not have kill messages, nor does it have magical GPS, and certainly, there are not an unlimited supply of planes. You'll have to confirm your kills at the end of each mission, and your co-pilot(s) will have to see that confirmed kill in order for it to count. Another note, the campaign is set to dead is dead. So if you die or get captured, you'll have to start your pilot's career over. Additionally, if you get injured, your pilot will need time heal and will miss out on a few battles while that happens. We're currently at the beginning of the war in December 1941 flying p40s for the 126th Fighter Squadron. Our squadron has seen many battles over the course of the last three months, and we expect to see more. to jump into our discord channel here: https://discord.gg/ujrMvGn.There, you'll see what has happened over the course of the campaign, as well as the current pilot roster and upcoming missions. a microphone and headset. We use push-to-talk in our discord. Any questions, feel free to reply to this thread, PM me, or message me or [TWB]Pand on discord. See y'all Wednesday! I'd recommend trying it out for anyone who is interested. PWCG finally supports coop missions and Sketch is the first one I know to run an open campaign with it. We actually started right after release. 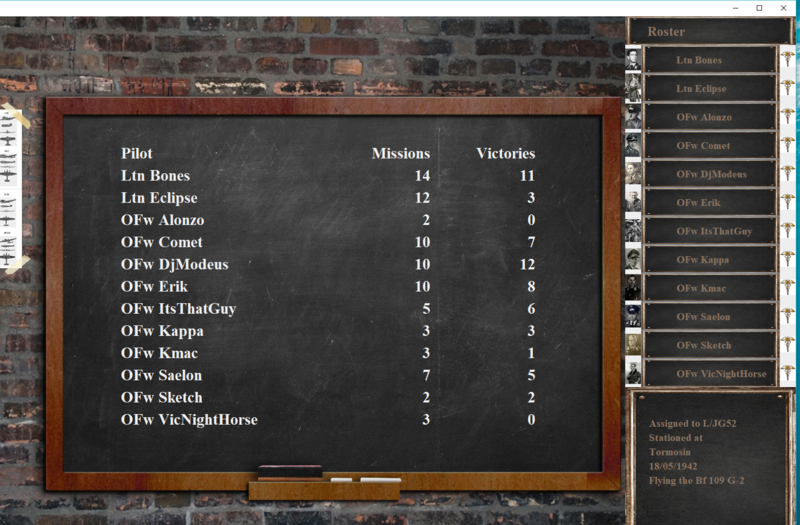 The campaign generator is working well and most missions are action packed. As always, there is the chance that you could fly a mission without encountering the enemy, but I'd say that's rare. Hope to see you ready for take off. Very sorry that you won't be able to fly with us, but I understand.  Maybe you could join @[DBS]Tx_Tip's Friday Night Bomber Flights? Their event is at an earlier time for EU pilots (and too early for most of us American pilots, as we're at work during the FNBFs). Event is tonight at 8pm Eastern Standard Time. See you then! 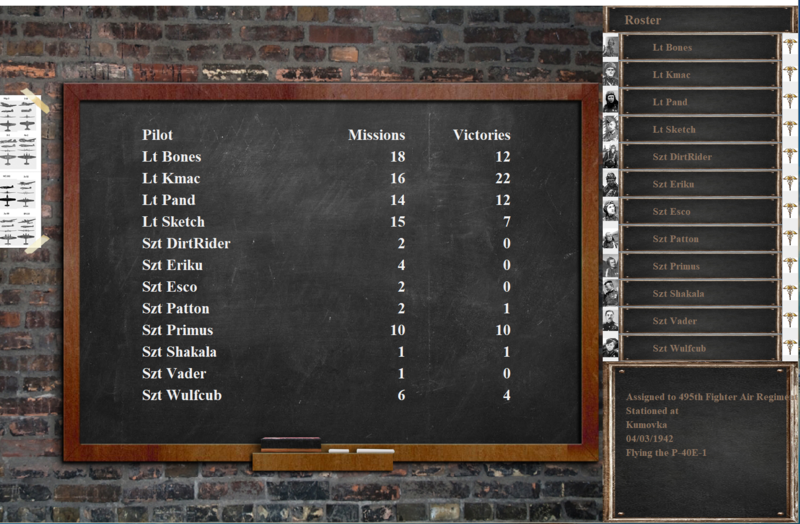 This is our current pilot roster after four months of war (and with a dead is dead system running in the background). Three of our pilots have made it to the officer's club, and Lt @[TWB]kmac31 is the war's top ace at 22 air victories and barely 16 missions in. 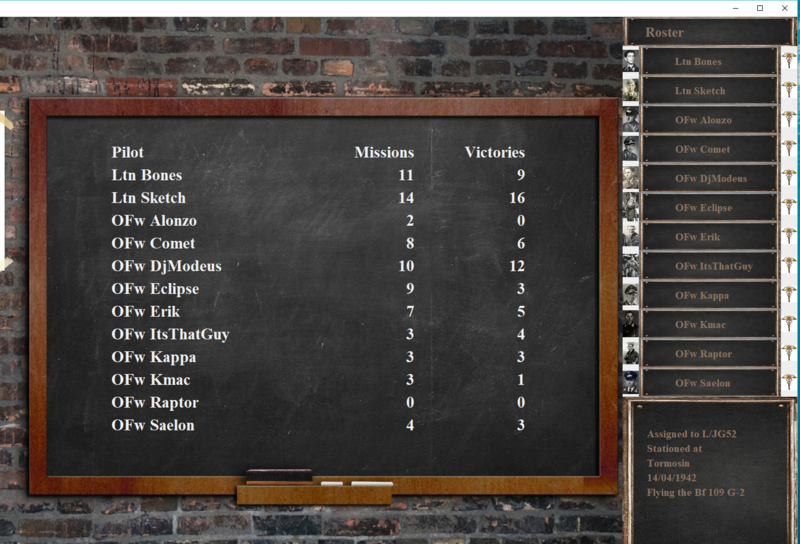 Again, good job to everyone that played in our 126th Fighter Regiment Campaign using p40s. 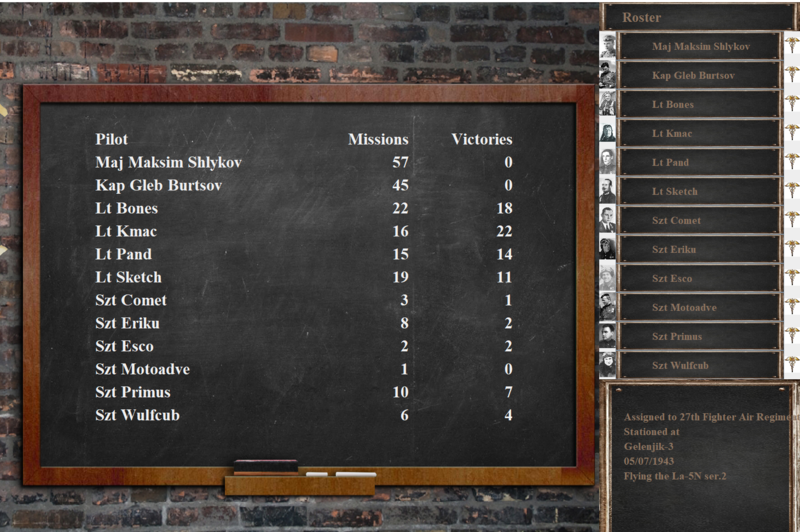 That campaign is over, but only because we wiped out every enemy plane. Here are the final stats from that campaign. Our next campaign, we will be using La5s and La5FNs, and it will start in the middle of 1943. If you played in the previous campaign, you will maintain your stats with the new one, but if you did not play, that's okay too. We still have open slots free. For those of you looking to fly Axis, we do have an impromptu Axis campaign running. Whenever we have free time, we fly a few Axis missions for the Jg52. You just have to be active on our Discord. Additionally, once we complete the war (1945) as Allied, or wipe out all enemy planes (as we did before), then we’ll start an Axis campaign from the beginning and I’ll reset the stats for all pilots. The new La5/La5FN campaign starts this Wednesday at 8pm Eastern, our normal time, and will go until about 10pmish. Please do be on time; if you’re late, you’ll have to join the second mission. See you guys then! 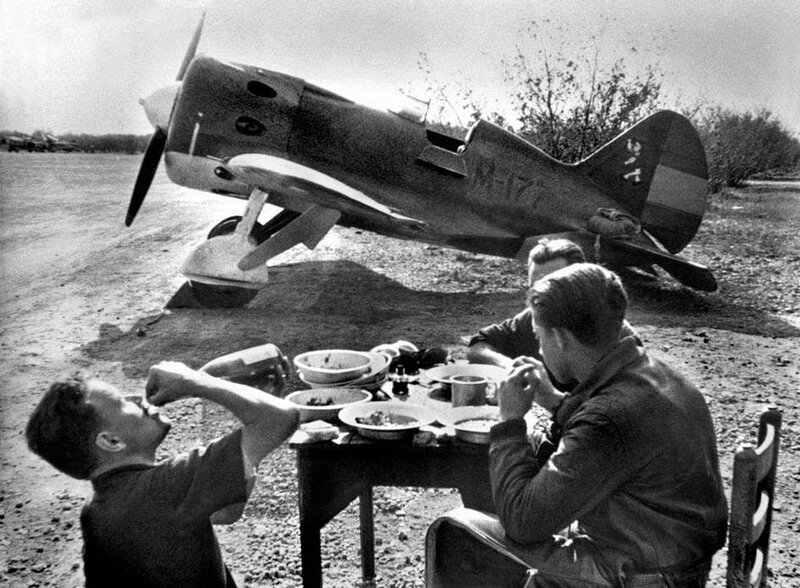 July 1st, 1943 - On the second day of our transfer from the 126th Fighter Regiment in Stalingrad to our new unit, the 27th Air Fighter Guard, in Kuban, we were tasked with patrolling the front lines. It was a rough start, as we had mechanical failures and by the end of the mission we had lost one pilot, Szt Comet, to our enemy bombers. He was last seen ramming an enemy He111, presumably because he ran out of ammo shooting down other He111s. Stalin would be proud. July 3rd, 1943 - One of our recon flights spotted multiple cargo ships off the bay just North of us. We could only assume to resupply the enemy forces. High Command tasked us with destroying the ships. In route, we found four 110s attacking our ships! We rightfully put a stop to that without dropping our ordnance while dogfighting the 110s. After destroying the enemy attackers, we set out for the boats. Our flight of six sunk one boat, and flames another. Finally, a successful mission! Lt Bones received the Order of the Patriotic War 1st Class medal for his actions. Our next fly out will be Wednesday September 12th at 8pm Eastern. If you have any questions, let us know. See you next Wednesday! Twitch embedding seems to not work? It's an odd quirk of the forum software that only the most recently active threads are highlighted as new posts. That means the far more active FNBF thread is more likely to show up in the forum activity summary. It's a shame because people might miss this thread and not get to know about, let alone experience, one of the best COOP events going. For better exposure of this recurring event, perhaps mission videos should be posted in the Videos forum and cross linked back to this forum thread. Another round of missions are scheduled for this Wednesday, September 12th at 8pm Eastern. We're still in LaGG3s/La5s/La5FNs flying for the 27th Air Fighter Guard in Kuban, and all your previous stats are persistent. Right now our squad has four pilots in the officer's club, and one non-commissioned officer that's already an ace. No need to sign up; just show up and have a good time. See you guys then, and if you have questions feel free to message me, reply to this thread, or ping me via Discord. Our first TAW run will be tomorrow, Monday, September 17th at 9pm Eastern. See you guys there. For those of you that were there tonight, we had some good action on TAW! Our entire group only lost two planes, and no one died. I hope everyone had a good time, and we'll fly out again on Wednesday, September 19th at 8pm Eastern. That event will be the normal PWCG Cooperative campaign against ai, but if you'd like to veto and instead fly TAW; just pm me here or in Discord. Regardless, we'll fly TAW again as a group on Saturday at 9pm Eastern Standard Time. Thanks again for everyone who came out, and I hope to see you all again Wednesday. Tonight, September 19th at 8pm Eastern Standard Time, the Eagle's Nest Cooperative Campaign will be flying using PWCG. Because Pat Wilson has updated his version of the campaign generator (we like to stay up-to-date), we will be flying as **Axis** in 109F4s in Stalingrad. That means an all new campaign, with new stats, new rewards, and an all new career for each of you guys. See you guys tonight! This Saturday, September 22nd at 9pm Eastern we will be flying together on TAW. As before, we'll be flying for the Russians. If you want to join up, then hit us up in Discord. Another day of campaigning will happen tomorrow, October 3rd at 8pm Eastern Standard Time. If you're interested in joining us, hit up this Discord channel: https://discord.gg/ujrMvGn See you guys tonight! 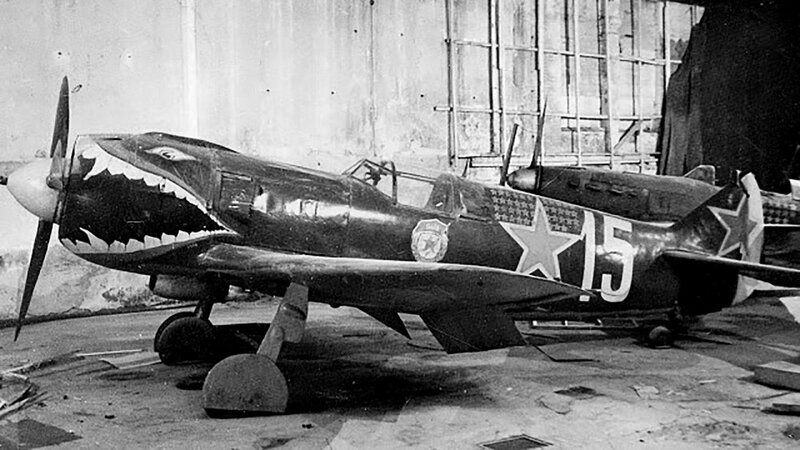 This Wednesday, October 24th at 8pm Eastern Standard Time, we continue the I./Jg52 cooperative campaign to secure our foothold into Russia. The campaign date is currently April 14th, 1942, and we're stationed in Tormosin. If you're interested in joining us, hit up our Discord channel. Wil there be an event this week? There will be no missions this Wednesday, October 31st due to Halloween. However, I'll be flying out on Friday, November 2nd a 11pm EST for some PVP action (Probably on Coconut's server, but any server really). Any and all are welcome to join. If you can manage all of the above please DO join. It's super fun and a very nice group to fly with. We have been flying 109 F4s. Since you are new to the game please make sure you have practiced your take-offs and landings with the 109F4. The main problem new players can cause is causing collisions with other players on takeoff or landing. ALL players directly involved in takeoff crashes/collisions are effectively "out" for the remaining duration of that COOP session so it is REALLY important to try and avoid takeoff and landing crashes. and finally you can get our campaign skin set here: https://drive.google.com/open?id=1OiPs0cixgE8ae2SGF9GjUfu498IIH-kf. Fantastic! I'm flying a 109 F4 in career mode currently so that's what I'm used to anyways I've joined the discord too. My landings have been getting better. My first half a dozen or so were all crash landings, but in my defense that's before I discovered that the flaps had to be lowered to a certain value, not just "released" in order to work. I spawn in the air mostly, so I've only taken off a few times; I’ll get to practicing that and my dogfighting before the next event! Thanks for the quick responses as well! I think I managed to convince a popular streamer to join us. FrooglePete from Froogle sim may be showing up next week. Hopefully he will check into this thread. Tonight, November 28th, 2018 at 8pm Eastern Standard Time we will be flying on TAW (instead of our typical campaign) for Russians. We will be on the TAW teamspeak and if we have a large group, the flights will be split up into three to four man groups. We'll be doing bombing, escorting, and anything else needed during our evening in TAW. See you guys then. Tonight, November 30th, 2018, at 10pm EST till 12am EST - the Point Blank Squad, the Eagle's Squadron, and TWB be flying on TAW. All are welcomed to join us. Just meet us on the TAW Teamspeak to join in the campaign fun (ip: taw-server.de:9988 password: taw1942). As before, groups will be split between fighters, attackers, and so on. Most likely the map will be on mission 2 - meaning a reset of your available planes and what planes are available for us pilots. Be sure to check which planes you have and don't have. Hopefully the Germans show up in force... See you guys tonight. What's the plan for tomorrow? TAW again? Tonight, December 19th, at 8pm EST, the Eagle's Nest, Point Blank, the Irregulars, and TWB will be flying out on TAW for the Red side (this campaign). Everyone is welcomed to join us: be they in another clan, learning the game, or are a lone wolf player looking for teammates. We'll meet in the TAW Teamspeak at 8pm. If you have any questions, message me here, in our Discord, or in Teamspeak during the event. See you guys tonight! Situation: German invaders press into Southern Russia in an attempt to capture the oil wells of the Caucasus. With the support of our American friends, we now have planes to fend off the aggressors. Briefing: All pilots are to remain on standby status. As soon as High Command has enough intel, they'll assign missions to us. Be expected to fly multiple missions. Very interested if this is still happening on Wednesdays. This does happen on Wednesdays. However, today we'll be out, and instead am hosting a TAW even this Friday. Don't worry, we'll be back next Wednesday though! 1.) As with all cooperative campaigns, if you die; you'll have to wait until the next mission to play again. This can sometimes be 40+ minutes per mission. 2. )As we've gotten better, so too has the AI level. Before they were at 'low' setting, and now they're at 'high'. That's only one step below the highest level, 'ace'. If this goes well, we'll keep them at that level, or if necessary I can lower the difficulty. 3. )If Pat updates his app, we'll still use the current version until the end of the month. Good luck, and see you guys Wednesday! Don't forget, today is the day that we'll be flying out in our P47s. See you tonight at 8pm EST! I want to thank everyone that came out tonight. We really need to work on our p47 skills eh? We'll fly out again next Wednesday. Same time, same plane! See you then. Every Wednesday, the gang meets up for some Pat Wilson Cooperative Campaign action. When I say gang, I don't mean just TWB, but everyone in the IL-2 community, and their Grandmothers too. We only ask that you have a mic, a good attitude, and are slightly more familiar with the p47 than we were last week. It was kind of an embarrassment! As with all our campaigns, we strive for realism. There's no kill feed, no special GPS to let you know where you are, and you only have one life to live. If you die, you'll be out of that mission and all your stats will reset for the campaign. Missions can sometimes be 40+ minutes long, so attempting to stay alive is generally a good idea. Additionally, any wins or losses go towards the squadron too. Therefore, being the killer ace that you are; will slowly stop the advance of the enemy, because they will have to wait for logistics to catch up to your *leet* skills. This Wednesday at 8pm EST, we will continue our P47 campaign flying as the 358th Fighter Group. The squadron could really use a few more good pilots like yourselves. We had a really rough time in our newly acquainted fighters, but I think this week will prove differently. Only time will tell.